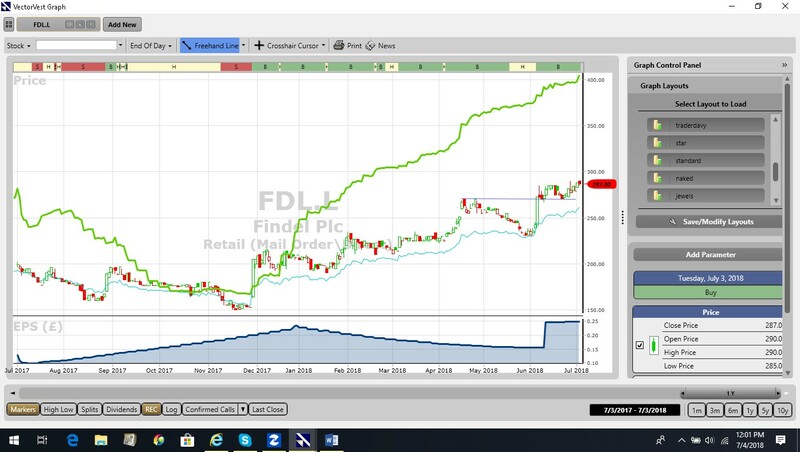 Home » VectorVest » Findel Plc #FDL.L is a company with genuine pedigree that looks set to deliver continued recovery and growth. Buy says VectorVest. Findel Plc #FDL.L is a company with genuine pedigree that looks set to deliver continued recovery and growth. Buy says VectorVest. By Harry Dacres-Dixon in VectorVest on 4th July 2018 . Accrington-based Findel Plc (FDL.L) owns a number of market leading businesses in the UK home shopping and education supplies markets. It is primarily a retailer and distributor, handling and supplying specialist products manufactured by third parties. The Group’s activities are focused in two main operating segments. Express Gifts – one of the largest direct mail order businesses in the UK, primarily trading via the Studio.co.uk brand; and Findel Education – the second largest listed independent supplier of resources and equipment (excluding information technology and publishing) to schools in the UK. During both Q1 and early Q2 2018, several key VectorVest metrics flagged up a potential turnaround at FDL. These included the RT (Relative Timing) metric, (a fast, smart, accurate indicator of a stock’s price trend) which today still logs 1.46, which is excellent on a scale of 0.00 – 2.00. Also included is the RV (Relative Value) metric, (an indicator of long-term price appreciation potential), which still today logs FDL at 1.42, again excellent on a scale of 0.00 to 2.00 Other high scoring metrics include an ‘excellent’ GRT (Earnings Growth Rate) of 25%, and despite trading at year highs of 288p, VectorVest still sees plenty more upside potential with a current value of 398p per share. 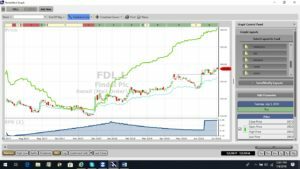 The chart of FDL.L is shown above in my normal format. The share is showing a strong uptrend and over the last month has tested a previous high charted in April 2018. This is very bullish price action. The share is on a Buy recommendation on VectorVest and looks highly probable to move higher. Summary: Combining a direct mail order business with an educational resource and equipment business may not be immediately obvious as a winning commercial combination, but with the origins of Findel Plc going back as far as 1962, it is clear the company has genuine pedigree. The recent difficulties experienced by Findel Educational are clearly being resolved: the increase in revenues and profits and reduction in debt tell their own story, and this combined with the illustrious group history adds up to an attractive investment that looks set to deliver continued recovery and growth. VectorVest rates FDL as buy.